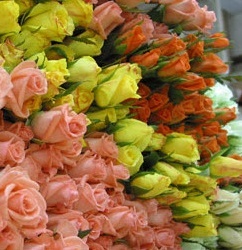 MyFlowerBuyer gives you premium wholesale roses fresh from farms in the world's best growing regions! The roses bathe in intense equatorial sunshine during the day, alternating with cool mountain air at night. The result is long-lasting flowers, brilliant color, and sturdy stems. Our partner farms use the highest standards for growing, processing and shipping flowers. They continuously monitor growing processes to ensure you get only highest quality wholesale roses. Options: Select your stem length and pack from the drop down menus. Assorted boxes contain 3 to 5 different colors. Actual color may vary with variety or the computer monitor you use. If you need a special assortment, please specify in the text box and check out, or call us at 1-877-553-9917. Most of the time we can accomodate special requests.